Chicken Dumplings- Steamed ground chicken, pickled vegetables. Ginger Asian sauce. La Brochette Tapas- Prime beef, chicken breast, pearl onions, red pepper, cherry tomatoes. Tomatillo and Mango chutney. Crispy Veal Sweetbreads Tempura- Sweetbreads drizzled with balsamic reduction and served with olive tapenade. Short Rib Spring Rolls- South Western slow cooked marinated short ribs, wild mushrooms served with BBQ ranch sauce. Chicken Soup- Shredded chicken, mélange of vegetables in rich chicken broth. 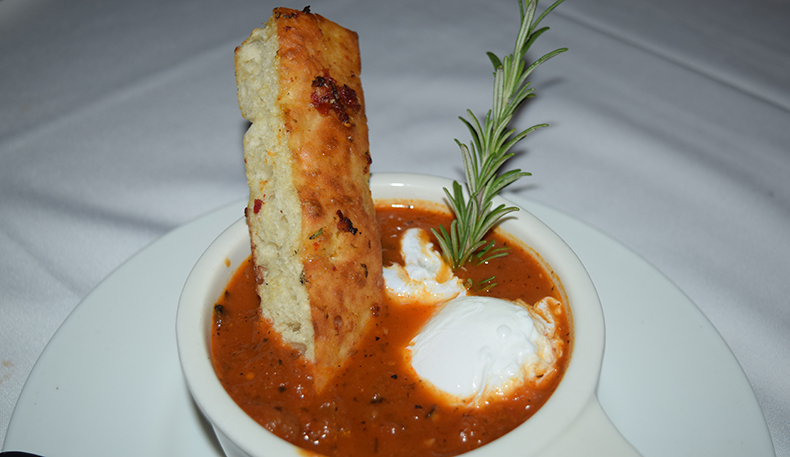 Beef Onion Soup- Caramelized onions, red wine topped with garlic croutons. Spinach Salad- Baby spinach, avocado, carrot ginger julienne, baby corn and Asian miso vinaigrette. Grilled Brochette Salad- Romaine hearts, asparagus, heart of palm, Roma tomatoes and lemon vinaigrette. Arugula Salad- Baby arugula, candy pecans, raisins, grannie smith apples and raisin wine vinaigrette. Beet Napoleon- Yellow and red beets, cucumber in layers with lemon dressing. Filet Mignon- Prime filet 10 oz. 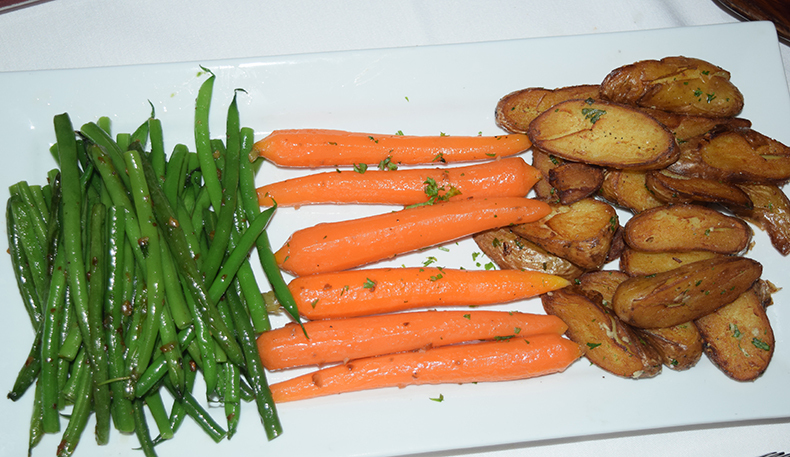 served sliced, with French fries and black trumpet brandy sauce. Steamed Red Snapper- Fresh select herbs, Israeli couscous and lemon caper sauce. 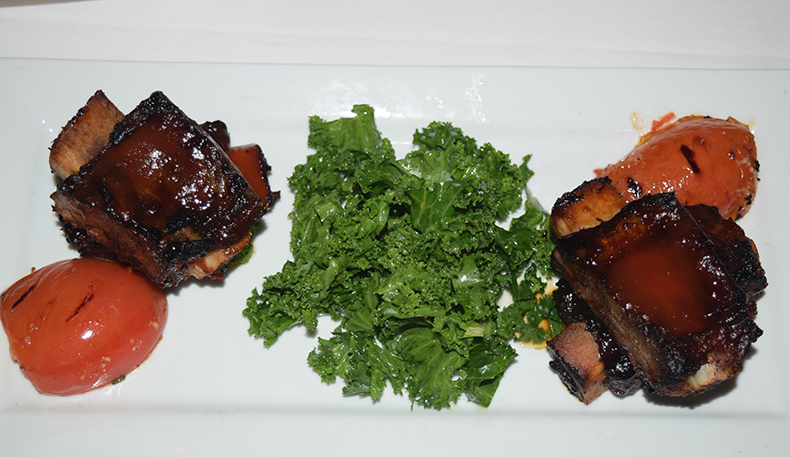 Asian Bbq Short Ribs- Slow roasted served with scallion mashed potato and frizzled onion. Lemon Crispy Chicken- Sweet corn pudding, Balsamic marinated Portobello mushrooms. Duck Confit- Seared duck breast, dry fruit parsnip puree and sherry blueberry sauce. Mediterranean Branzino- Pan seared served with barley pilaf and red pepper basil sauce. Côte De Veau-Veal chop seared to temperature, mushroom gnocchi, haricot vert and truffle essence mushroom sauce. Delmonico “Classique”-Onion rings, mashed potatoes, marrow bone, black pepper corn sauce. Chicken Marsala-Lightly sautéed chicken breast with wild mushrooms, whipped mashed potatoes, sautéed spinach, Marsala wine sauce. Scottish Salmon-Pan seared filet with red wine risotto, sautéed vegetables and teriyaki sauce. 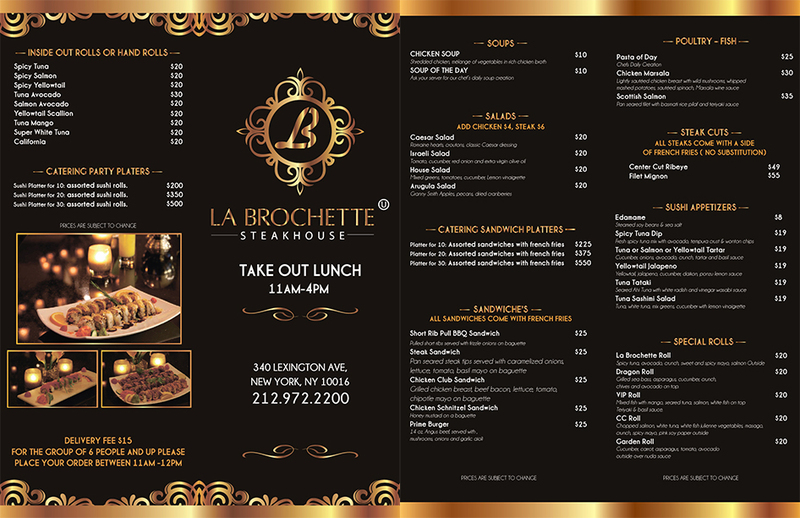 � How was your last visit to La Brochette? 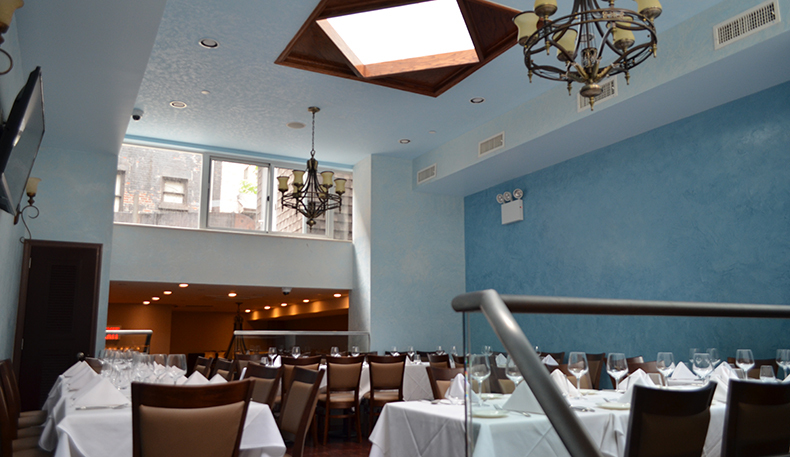 5 dining rooms on 3 levels with the top floor featuring a skylight. 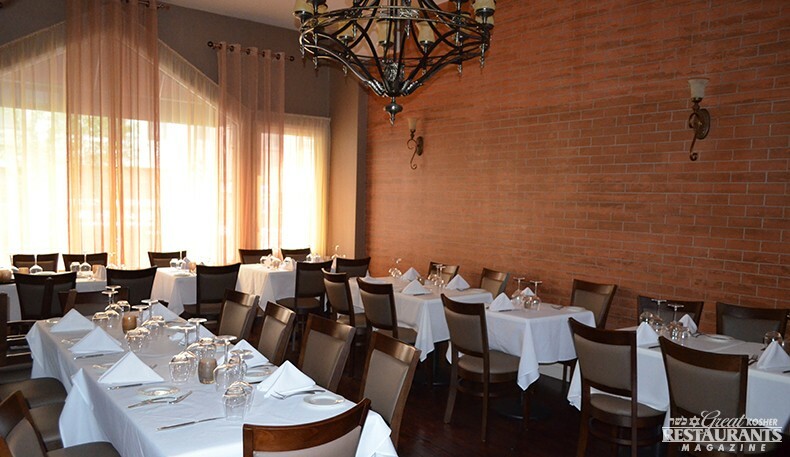 Although the restaurant is large, the setting is intimate. The neutrally-hued décor features chandeliers and candle-lit mahogany tables, yet the streamlined design has a contemporary feel to it. 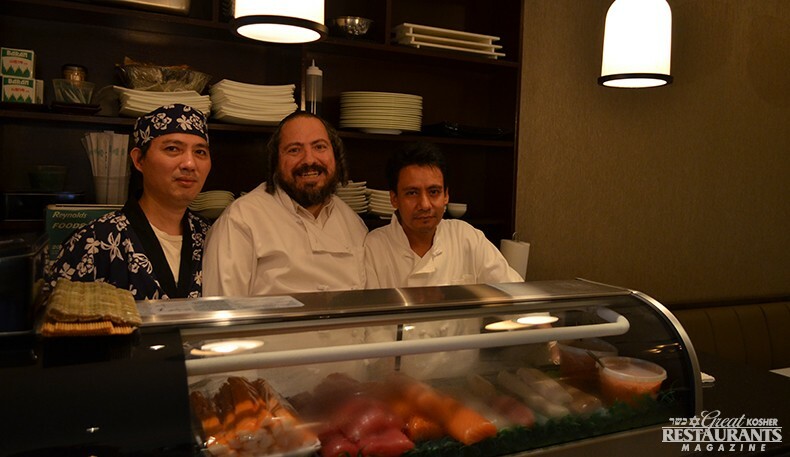 skillfully prepared to your liking by their chef. You can’t go wrong with choosing either of their juicy steaks. 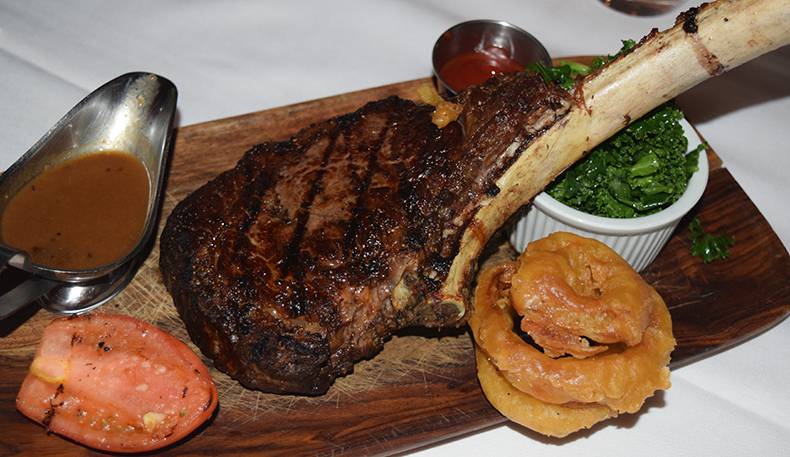 Some of the delicious favorites include Premium Delmonico and Prime Rib on the Bone. Another succulent dish not to be missed is the Braised Short Ribs, served with parsnip puree, julienne vegetables and bourbon reduction. 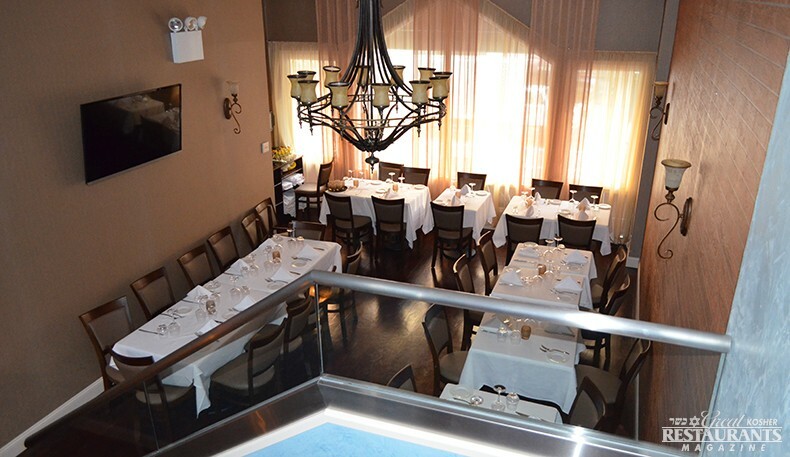 La Brochette also offers excellent poultry and fish choices such as Chicken Marsala (lightly sautéed chicken breast with wild mushrooms, whipped mash potatoes, and Marsala wine sauce) or Chilean Sea Bass. 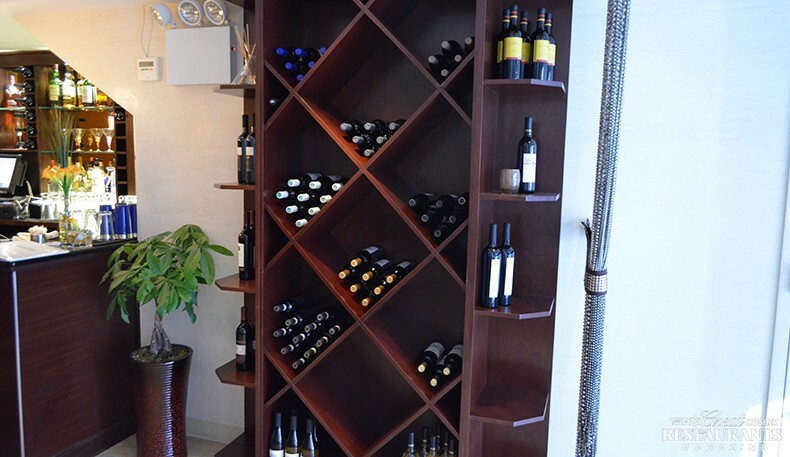 Their extensive wine list suggests you should choose a perfect accompaniment to your meal. On the dessert front, La Brochette spoils you with a wide variety of parve homemade cakes and pastries, including decadent Tiramisu, Cheesecake, and Chocolate Lava Cake. After a satisfying meal in this chic environment, one can feel the restaurant is true to its goal: to make diners’ experience as pleasing to the senses as it is to the palate. 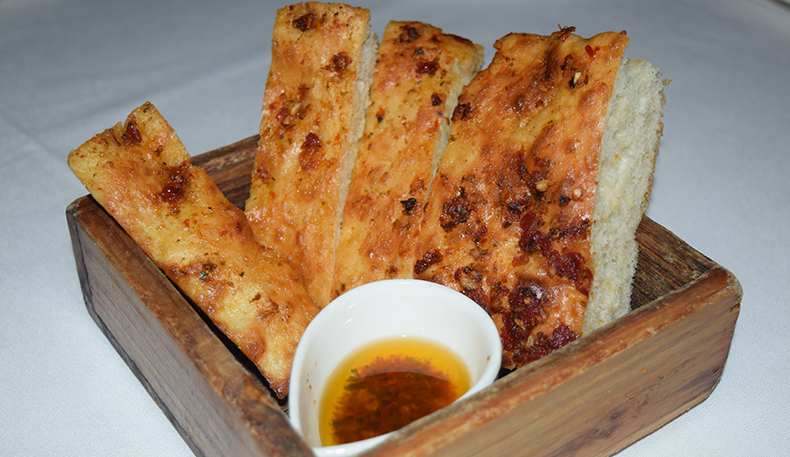 Owner Avi Cohen has outdone himself with the newly opened, La Brochette. 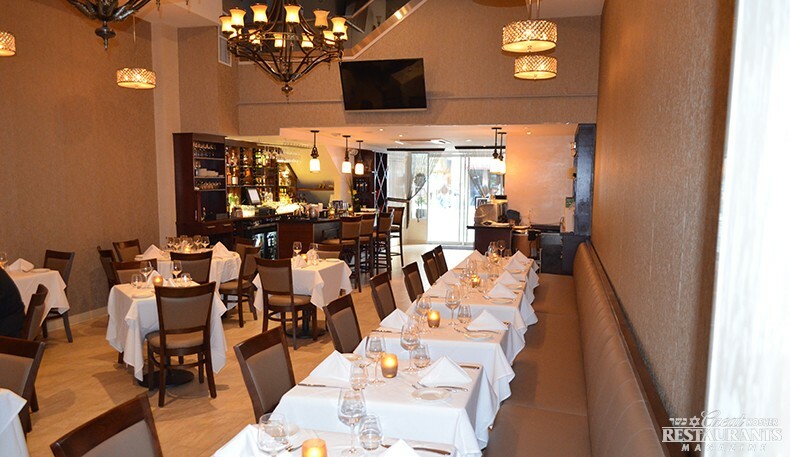 Beautifully appealing architecture and ambience lends its way to the deliciously tasty French cuisine served up at this upscale steakhouse in the heart of midtown Manhattan. preference – as there are three levels to choose from. White tablecloths and napkins grace the warm mahogany tables which are decked out ever so elegantly with fine china, flatware and clean cut glassware. 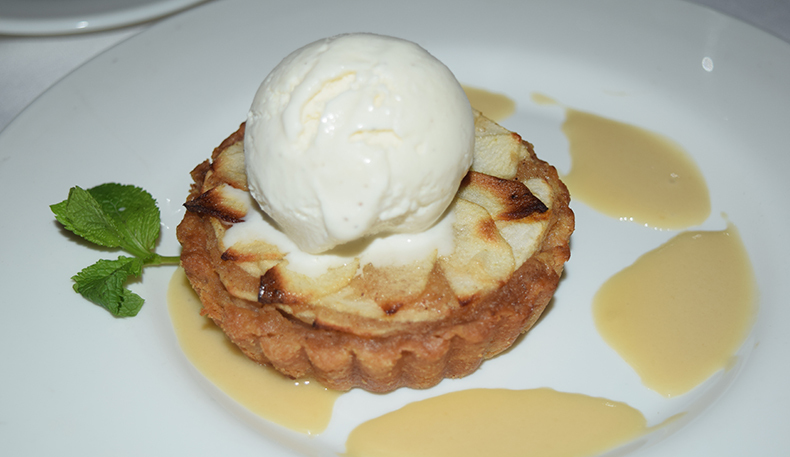 The artfully designed menus are loaded with decadent dishes to choose from. 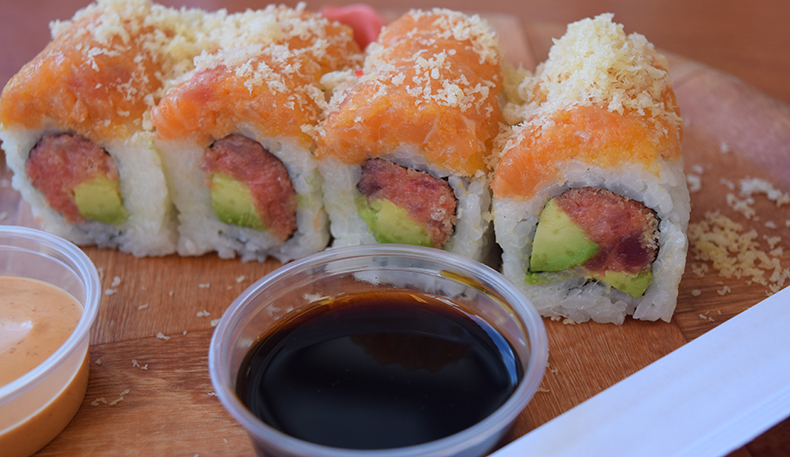 Steaks are juicy and seared to perfection and their sushi is par excellence. Every bite off of every dish is bursting with fresh flavors and the presentations are inspiringly creative. On “live nights” enjoy being serenaded by violinists or saxophonists which definitely adds some joie de vivre. 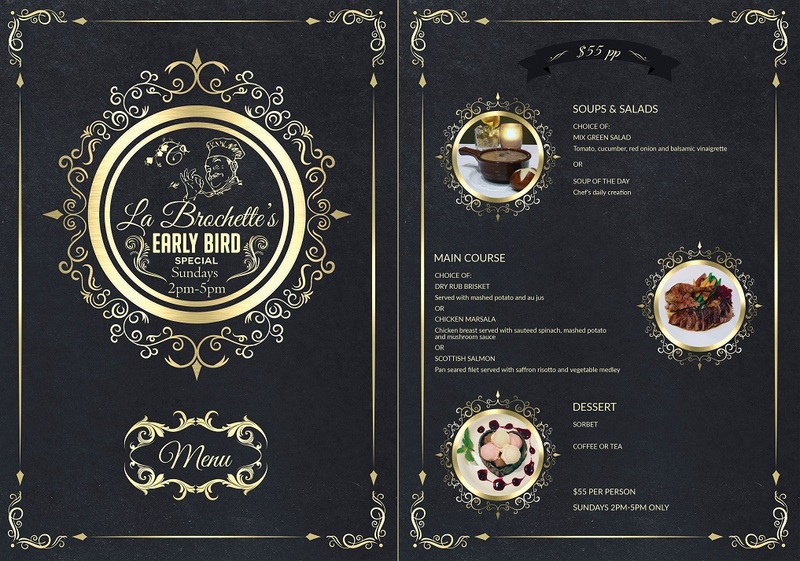 So when looking for a night out on the town La Brochette is the ultimate dining experience! The food was fabulous! We like the new look. We were regulars at La Carne Grill and missed it terribly. This is a really great place. Service was outstanding. Only one criticism, the musician (which is a nice idea), really didn't play for us. He played for two minutes and then went out to smoke. He also kept running back and forth without playing anything. We were the only ones in the restaurant. Just to be clear we loved the restaurant and hopes it succeeds!